The Ridge Community Church welcomes everyone to an Easter celebration with engaging music, a relatable and applicable message, and lots of fun Easter favorites! Meanwhile, Ridge Kids will get a hero's treatment while learning about Jesus through fun programming in a safe environment. If you've never been to church, or if you've been away for a while, we want you to know that you will be welcomed here. Our dress is casual, our atmosphere is friendly, and we like to think of ourselves as a church for people who don't like church. Sound like you? You're just like us, and we hope to see you this Easter. All services Easter Sunday will be shown on our online campus and our Roku channel. Happy Easter and we hope to see you soon! Excelsior! Ridge Kids is moving ever upward with their experience this Easter. Some larger-than-life heroes will make a special appearance, kids will have lots of fun with age-appropriate programming, and a free gift is available for every kid who attends Ridge Kids. Download and give to a friend! 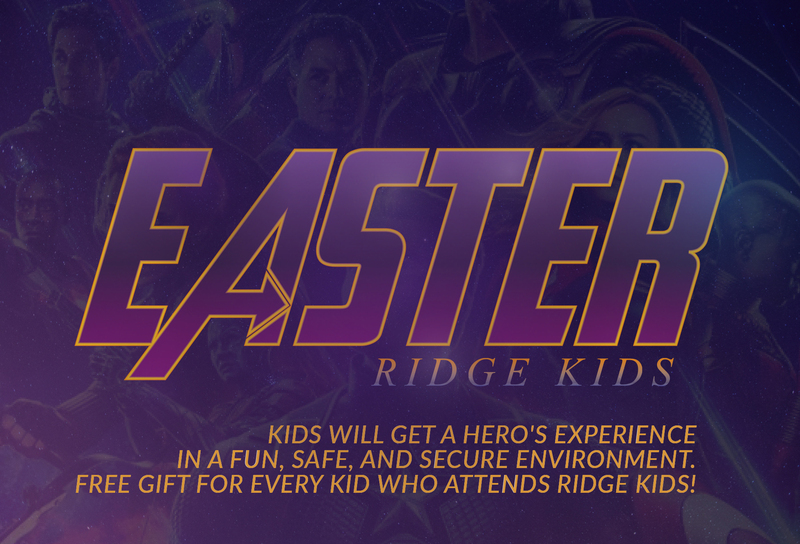 Avengers are coming to Ridge Kids! Help make our services a great experience for everyone who attends. We've got plenty of fun areas to check out. Click a campus to get started.